Another Memorial Day, another trip to the East Side with She Who Must Be Obeyed. 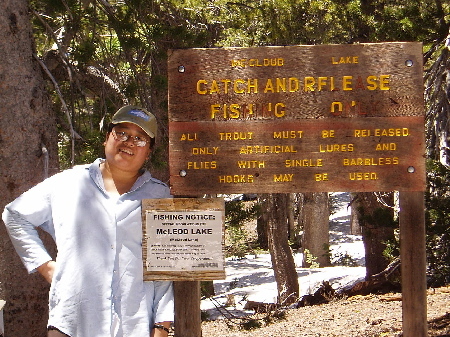 These trips are less about fishing than they are about us spending time together but we always manage to get in some good high country hiking and fishing and this trip was no exception. The adventure began on Tuesday, after spending Sunday at Hot Creek and Memorial Day shopping, we felt we were acclimatized enough to make our first high country foray of the year. 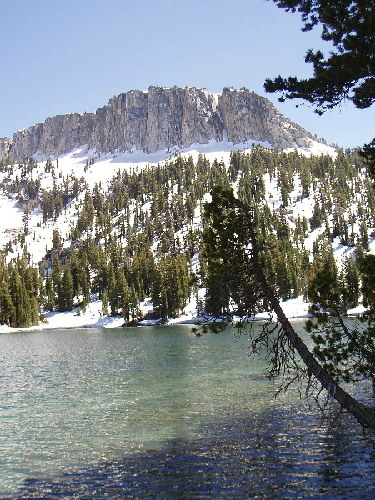 McCloud Lake would be the destination, high country home of Lahontan Cutthroat Trout. Vita and I drove to the trailhead, expecting to find the road blocked, it was not. This would be a plus as Vita is not a great hiker and would have to hike a half mile less to the lake. I reached the trailhead with mixed emotions. The trail was clear of snow, which was good as far as Vita was concerned but I’d never hiked up to the lake without snow. I was concerned that this early in the season the lake had not received enough visitors to make the way obvious. My concern soon abated as the trail was obviously well used regardless of the early season. We made our way up the trail, the steepest section was still covered with slushy, icy snow. We were the first persons up the trail this morning and so I kicked footholds in the snow for Vita to follow. She made her way through the slippery snow field without batting an eye. The lake was much more swollen than the last time I had visited. Perhaps because during my first visit I was met with a half frozen lake, this time around the lake was completely clear. I quickly made my way to the far side of the lake while Vita found a place to sit and read. On the far side I was encourage to find cruising fish. 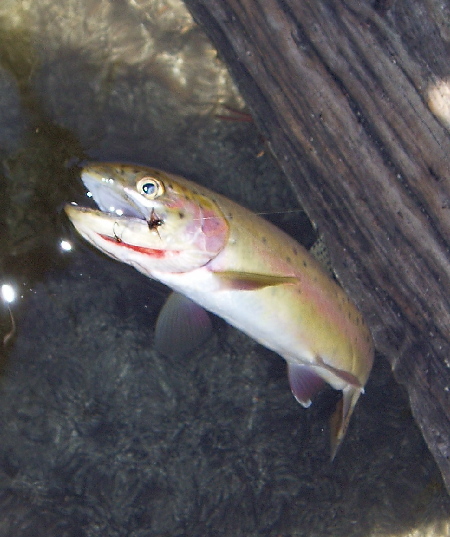 The water was extremely clear and I could clearly see the colors and spots on the fish as they cruised by. The fished cruised as individuals and in pods, at approximately 10 and 20 minute intervals. The first hour I adopted a strategy of sight fishing to fish as they cruised by. This didn’t work. If the movement of my rod didn’t move a fish of it’s line, then it simply would show no interest in my dry flies. The funning thing is that I thought of starting off fishing an ant but over the past year, ant’s have not done very well for me. I started off with last year’s 2 best flies, the EC Caddis and Sierra Bright Dot. The EC Caddis would garner a look but was always met with rejection. The Sierra Bright Dot and subsequent Parachute Adams were not acknowledged. It didn’t take long for the fish to adjust their cruising lanes so that they were cruising just inside the darkening, deeper water over 35 feet from shore. This put them at just about the limit of my roll casting ability with the particular rod I was using. At one point I put on an ant pattern and managed to roll cast about 50ft, 15ft or so past the transition of clear water and the dark void. Almost instantly a fish slammed my fly. This would be my first Lahontan Cutt; it was a good fish and I was pretty excited. So excited that I worried more about getting my camera ready than landing the fish and … well, need I say more. 15 feet or so past the drop off seemed to be the sweet spot. I was sure that if I could get my fly in that area, I could catch fish. Unfortunately, I couldn’t duplicate that single cast. 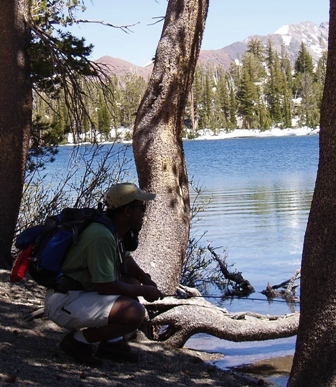 The next day, confident McCloud Lake was a nut I could crack, I returned with waders and boots in tow. Wading out 10 or 15 feet, I could easily reach the darkening water and as a result, picked up fish- about a dozen over 4 hours averaging from 10 to 13 inches, with most in the foot long range.